 Motorvagnståg 7-delat VT 11.5 "TEE" typ DB "24-karat Guld"
Motorvagnståg 7-delat VT 11.5 "TEE" typ DB "24-karat Guld"
Denna produkt ger dig 22494 bonuspoäng. Dieseldrivet motorvagnståg 7-delat VT 11.5 'TEE' typ DB '24-karat Guld', platinerade med 24 karats guld, mfx+ digitaldekoder och ljudmodul, högeffektsdrivning, slirskydd, fabriksinstallerad belysning, ljusväxling. Limiterad utgåva i 1500 exemplar, levereras i en exklusiv förpackning. Certifikat medföljer. Model: The train is a 7-part set. The powered end cars and intermediate cars are plated with 24 carat fine gold. The train has an mfx+ digital decoder and extensive sound functions. Each powered end car has controlled high-efficiency propulsion. Each powered end car has a truck with both axles powered. Traction tires. The intermediate cars have factory built-in interior lighting. The triple headlights and dual red marker lights change over with the direction of travel. They and the interior lighting will work in conventional operation and can be controlled digitally. Maintenance-free, warm white and red LEDs are used for the lighting. The train has a power pickup feature whereby power is picked up from the pickup shoe in the powered end car at the front of the train. The train has special multiple conductor close couplings and tight closing diaphragms with guide mechanisms between the cars. The ends of the train has a reproduction of the covered Scharfenberg coupler (non-working) at both ends. The powered rail car train is being delivered in exclusive packaging with a certificate of authenticity. 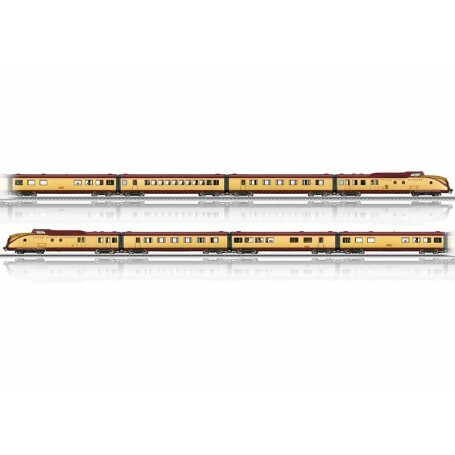 The powered rail car train and the certificate of authenticity are consecutively numbered. Train length over the couplers 151 cm / 59-7/16'. One-time exclusive edition for the start of the European TEE service 60 years ago on June 2, 1957. The powered end cars and intermediate cars are plated with 24 carat fine gold. Each powered rail car train is consecutively numbered. mfx+ World of Operation digital decoder and extensive sound functions included. Factory built-in interior lighting with warm white LEDs included.